Of late, there have been a lot of reports about Indian information technology (IT) firms showing a renewed interest in the domestic market. They have been accompanied by reports of large deals in the pipeline such as a $500 million (Rs2,445 crore) outsourcing contract of the Indian Railways for a human resources management system. In the fiscal year ended March, the domestic IT outsourcing and business process outsourcing (BPO) market grew by 21% to Rs57,000 crore (around $12 billion). The exports market, in contrast, grew at a slower rate of 16.3% to $46.3 billion. This is the first time in years that the growth in the overseas markets lagged that of the domestic market (see chart). While releasing these industry-wide numbers in July this year, the National Association of Software and Service Companies (Nasscom) said, “The domestic market witnessed enhanced focus in FY09, with large transformational deals in telecom and e-governance. Domestic BPO got a special boost with over 40% growth in this period." 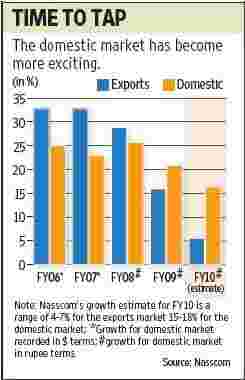 The divergence in growth rates between the domestic and overseas markets is set to widen further, based on estimates put out by Nasscom. Exports are expected to grow between 4% and 7%, while the domestic market is expected to grow between 15% and 18%. It’s true that the base is much smaller for the domestic market, but at current levels of $12 billion, it presents a significant opportunity. It’s also one that can’t be ignored given the slowdown in order wins in overseas markets. As pointed out earlier, things are slowly changing. Companies such as Infosys Technologies Ltd, which have in the past shied away from domestic deals, are bidding for more and more domestic projects. TCS is aiming to double its revenue from the domestic business to $1 billion over the next three-four years. One of the main reasons the Indian IT industry focused most of its energies on the overseas markets was that margins in the domestic business were relatively lower. Besides, exports allowed them to enjoy tax breaks. With the sunset clause on tax breaks under section 10A and 10B of the Income-tax Act coming to an end soon, this advantage will soon cease. And as far as gross margins go, some analysts feel that Indian IT firms can enjoy reasonably high margins even in the domestic market with some tweaking in the business approach. For instance, Wipro and IBM derive a relatively high revenue per employee for their India businesses, which is possible because they sub-contract some part of the work to smaller IT firms. This part of the work is normally low-margin and the benefit for large IT vendors such as Wipro is that it does not have to maintain a large bench to support a higher volume of work in India. Wipro’s Indian IT business, for instance, grew by 40% in the last fiscal year, without adding to headcount. Since IBM, TCS and Wipro have been working with Indian firms for a long time, they already have systems in place to deliver work on a low-cost basis by tying up with small IT firms, as well as manage the hardware component of large IT deals more smoothly. Infosys has in the past shied away from deals with a large hardware component because of low margins. The domestic market opportunity is there for the taking and with some tweaking in its business approach, the Indian IT industry can be a big beneficiary from the growth in this market.